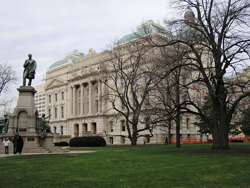 The Indiana State Capitol, the Statehouse, has been the seat of Indiana’s government since 1887 and is perhaps the grandest 19th-century Neo-Classical Revival building in Indiana. Alexander Ralston balanced his plan for the city with two symmetrically placed sites on Market Street east and west of the circle. The west parcel, a terminal point of Market, is the site he chose for a state capitol building. In 1878, a committee selected Indianapolis architect Edwin May to design the new capitol building after an earlier one on the site was demolished. His winning concept was an extended Greek cross plan with formal entrance pavilions on each face, capped by an Italian Renaissance style dome. May died in 1880, when only the cornerstone had been laid. The building was completed by his assistant, Adolph Scherrer, a Swiss born architect trained in Vienna before coming to Indianapolis. Scherrer changed many façade details and supervised construction. The General Assembly began meeting in the new Statehouse in 1887, one year before its formal completion. The Washington Street elevation is an excellent place to begin a tour of the Statehouse. The entire building is veneered in Indiana limestone quarried in Lawrence, Owen, and Monroe Counties in southern Indiana. The north and south faces are similar, each with Corinthian porticoes flanked by pavilions with low domes. Scherrer’s bold, plastic design for the various façades included a rusticated base, pedimented window hoods, and pediments on each corner pavilion face, richly carved with foliate work. The south elevation fronted on the National Road and has more ornamentation. The sculptural program atop the portico is The Westward Journey. On the left side of the cornice ledge, Native Americans are forced west, while Euro-American pioneers enter from the east. The interior was carefully restored in the late 1980s. The two courtyards with skylights north and south of the rotunda are lined with three story arcades of marble columns. Original oak doorways and marble paneling were cleaned as part of the restoration. The wall and ceiling stencil work was replicated as were the ornate brass chandeliers. Gold leaf was reapplied to surfaces long rendered dull by constant use. The rotunda is one of the city’s magnificent historic spaces. The diverse collection of monuments on the lawn provides a social and political history of Indiana. The Christopher Columbus Monument on the south half, west lawn was sculpted by Enrico Vittori. The bronze bust of Christopher Columbus sits on a tall granite pedestal with inscriptions stating that Italian American communities in Indiana dedicated the monument in 1920. The Coal Miner Monument on the north half, west lawn was sculpted by John Szaton in 1966 and symbolizes the sacrifice of Indiana’s miners to the economy. Indiana’s western and southwestern regions have significant coal deposits that have been mined since the 19th century. The National Road Monument on the central edge of the south lawn commemorates the role of the National Road in the settlement of Indiana. The Caroline Scott Harrison Chapter of the D.A.R. placed this scroll-pedimented tablet of Indiana limestone here in 1916, as part of Indiana’s centennial celebrations. The George Washington/Masonic Monument at the center of the south lawn was sculpted by Donald DeLue. George Washington, America’s best-known member of this fraternal organization, symbolizes the importance of Masonic lodges in Indiana history. Washington faces the National Road, for which he first saw the need. Two monuments honor Indiana governors. The Governor Thomas Hendricks Monument at the southeast corner was sculpted by Richard Henry Park. Hendricks served in the Indiana General Assembly, U.S. Senate, and as Governor of Indiana and Vice-President of the United States under Grover Cleveland. The chapel-like pedestal has two allegorical figures, Justice and Enlightenment. The full height standing figure of Hendricks crowning the monument faces southeast to Shelbyville and Hanover, where he lived before moving to Indianapolis. 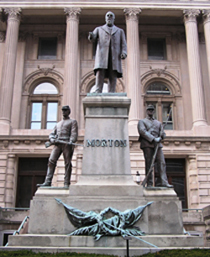 The Governor Oliver Morton Monument at the east entrance was completed by Rudolf Schwarz in 1907 to commemorate Indiana’s Civil War governor. Its style and placement strongly tie it to the State Soldiers and Sailors Monument, pieces of which also were sculpted by Schwarz. The detail is remarkable, not only on Morton, but on the authentically equipped soldiers, the cavalry man with Spencer repeater, and the infantry man with bayonet-topped musket. The flanking granite railings with bronze relief panels show Morton comforting families of soldiers and rallying troops. The Indiana State Capitol is located at the corner of West Washington St. at Capitol Ave. The Statehouse is open business hours on weekdays; go to the tour desk for a guided tour. View the manuscript original of the State Constitution in the impressive rotunda.